click: Place 1 power counter on Puffer or remove 1 power counter from Puffer. 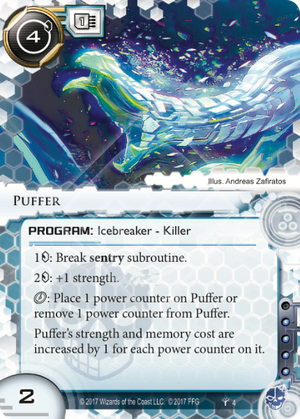 Puffer's strength and memory cost are increased by 1 for each power counter on it. What happens if the Runner uses Puffer's click ability while it is hosted on an Omni-drive? Puffer is trashed as it no longer can be hosted on the Omni-drive. Puffer is not a great killer as is. 2 to boost is just too much to be good (although par for the course for killers) and a 2 killer that only breaks 3 strength or less sentries without boosting is pretty mediocre. Considering the main competition in criminal: Mongoose, Femme Fatale, Lustig and Golden I wouldn't want to say Puffer is bad but it's not ahead of the pack either. All that changes though if you have a way to install programs without taking up MU. There are four general purpose cards for that: NetChip, Dinosaurus, Leprechaun and Dhegdheer. NetChip requires a lot of influence and space if you want to use it. Dinosaurus takes up the console slot. But Leprechaun (1, allows hosting 2 programs, 2 influence) and Dhegdheer (0, allows hosting 1 program, 2 influence) are perfect for hosting Puffer. Let me just assume Dhegdheer is going to be used since unless you have a lot of MU expensive programs the risk of installing 2 programs on Leprechaun given program destruction likely outweighs the benefits. If you manage to install Puffer on Dhegdheer the cost benefit ratio changes dramatically. You just need to spend a few clicks to match the worst ice you expect to encounter and you can break any ice by paying 1 per sub. That's Paperclip levels of efficiency (once you've set it up). Even if you don't have the strength matched when you encounter a piece of ice Puffer has a fallback option in just paying 2 per strength you lack. So unless you're running on a really tight budget you're not going to get into trouble with Puffer/Dhegdheer. And note that even if you don't have Dhegdheer yet and still need to run Puffer is not a bad killer. It's perfectly reasonable to install a Puffer, run inefficiently at first and later once you get Dhegdheer out install a new Puffer to replace the old one. The downside of this whole arrangement is that you need at least a few Dhegdheers in your deck if you want to have a good shot at drawing it early enough to make a difference. So that's 4-6 influence you need to spend on your sentry breaker as a criminal. That's uncomfortable unless you can make the Dhegdheers pull their weight in other ways as well, e.g. with Data Folding (though that's more of a long term strategy which might not yield results early enough for criminals). I had originally discarded the idea of using Puffer out of faction due to the high influence cost. But a single Puffer in a shaper deck that already runs Dheghdeers and Self-modifying Code might just be worth it.